Judgment of the Light is a Booster Pack in the Yu-Gi-Oh! Official Card Game (OCG) and Yu-Gi-Oh! Trading Card Game (TCG). 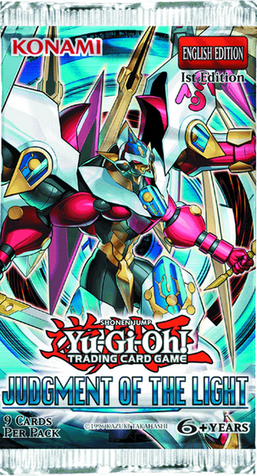 It is the fifth set in the OCG's 8th series, following Lord of the Tachyon Galaxy. It is followed by Shadow Specters. Contains new members and support for the "Archfiend", "Duston", "Fire Fist", "Plant Princess", "Galaxy", "Mecha Phantom Beast", "Number", "Number C", "Photon", "Prophecy", "Shark" and "Trap Hole" archetypes. Introduces the "Bujin", "Star Seraph", "Traptrix", "Super Defense Robot" and "Umbral Horror" archetypes/series. The TCG version of the set also includes new members and support for the "Noble Knight", "Junk", "Fire King", "Coach" and "Madolche" archetypes. This page was last edited on 13 March 2019, at 15:12.